Got what it takes to be an Airborne reenactor? Find out how you can get involved and take part in a variety of activities in the region and across the country. CLICK HERE to find out how! 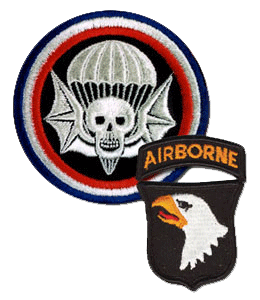 Airborne Reenactors, Inc. is a registered 501c3 non-profit organization with members in the north eastern United States. To find out more about how you can contribute to our efforts, visit our SUPPORT page. To learn more about the our educational and community services, click on MISSION. Nothing has captured the imagination of today's generation like the bravery and sacrifice of "The Greatest Generation". For those men and women, military and civilian, who endured the Second World War, our nation and the world owe a debt of gratitude.